The elevated numbers are not related to last week's sewage spill, the city's spokeswoman says. East End Beach in Portland had a warning posted Friday saying that swimming in water with high levels of bacteria may cause illness. 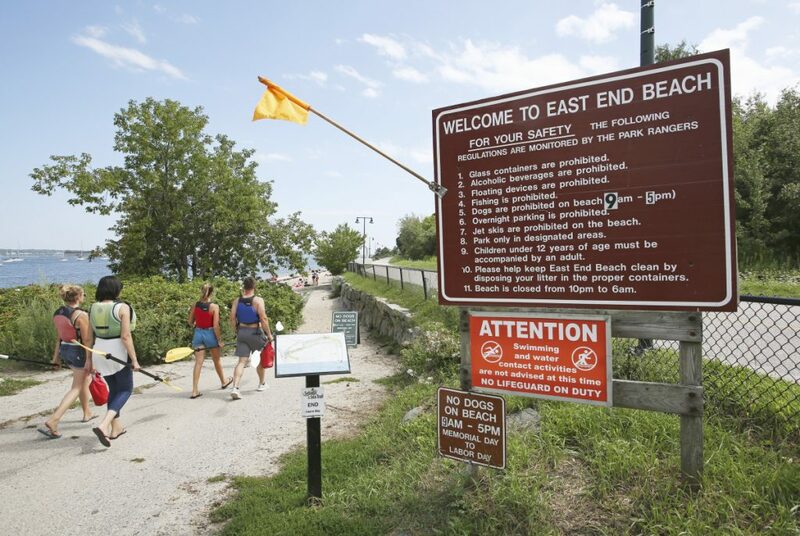 Bacteria levels rose again this week at East End Beach in Portland, prompting a swim advisory to be posted on Friday by the city, eight days after the beach was closed because of a city sewage overflow. The swim advisory warns beachgoers that swimming with high levels of bacteria may cause illness. 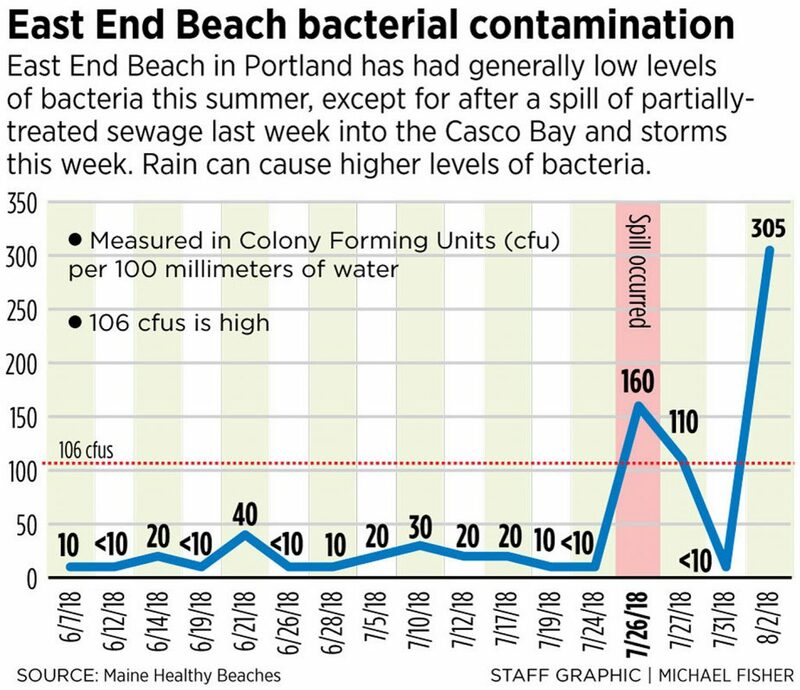 An estimated 1.5 million gallons of partially treated sewage spilled into Casco Bay on July 26, elevating bacteria levels and causing the beach to be closed for the first time since Aug. 14, 2014. A storm combined with human error caused the chlorine-treated sewage to overflow treatment tanks, pouring into the west of the beach and the boat launch. The event jeopardized the July 28 Peaks to Portland swimming race, a 2.4-mile course that goes from Peaks Island and ends at East End Beach. But bacteria levels plummeted, and the race, which typically attracts about 450 swimmers, went on as scheduled. Last week, bacteria levels reached 160 colony-forming units of bacteria per 100 milliliters of water, above the threshold for swim advisories of 104 cfu, before declining to 10 cfu, which was reported the day before the race. On Friday, reported levels were at 305 cfu, taken from Thursday testing, but the beach was not closed. Instead, the city chose to issue the swim advisory, posting signs warning of dangers. 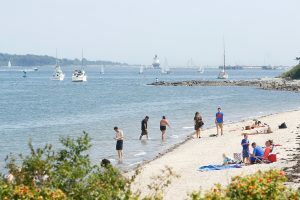 Meagan Sims, Maine Healthy Beaches coordinator, said it’s not only bacteria testing that goes into a decision to close a beach – which is a rare occurrence in Maine. “We do not close beaches based on bacteria counts alone. These tests are highly variable. Bacteria can be at high levels in one area, and then much lower a short distance away,” Sims said. People visit East End Beach on a hot Friday afternoon. The beach had a warning about high bacteria levels. She said there has to be some corroborating reason to close a beach – in last week’s case the sewage spill combined with the test results prompted the closure. Sims said beach closures occur when there are known safety hazards, such as sewage treatment plant malfunctions, severe flooding, rip currents or sharks. Bacteria counts also tend to be higher after a rainfall. Maine Healthy Beaches – funded by the U.S. Environmental Protection Agency – is a collaboration between the University of Maine Cooperative Extension and the Maine Department of Environmental Protection. Maine Healthy Beaches makes recommendations and it’s up to the beach owners, in this case the city of Portland, to make the call on whether to post advisories or close a beach. Jessica Grondin, city of Portland spokeswoman, said that the high bacteria levels this week were not related to last week’s sewage spill. The overflow was caused by human error, a report by the Portland Water District concluded on Tuesday, related to cleaning a chlorine tank. The part of the Eastern Prom Trail that had been washed away was repaired this week.